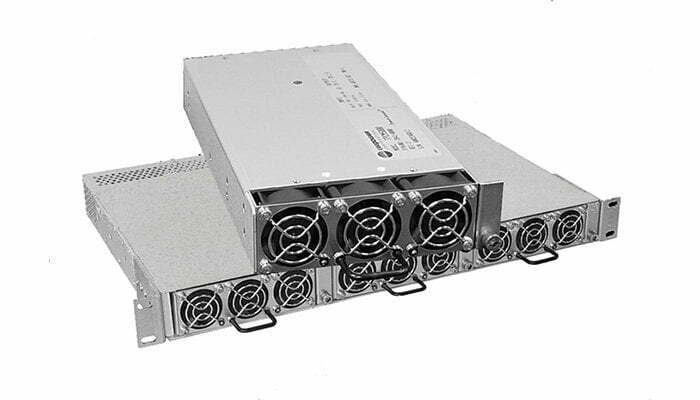 The Radian TPCM3000 is a hot-swap, modular 650 Watt 12 Volt AC-DC Front-End. The TPCM3000 650 Watt 12 Volt AC-DC Front-End is ultra-compact with a power density of 8.1 Watts per cubic inch. Companion 19/23-inch 1RU rack-mount power shelves hold up to three rectifiers which can also be operated in a 2+1 redundant mode. The modules have automatic load sharing and output ORing diodes so they can be hot-swapped while the system is operating. The TPCM3000 650 Watt 12 Volt AC-DC Front-End output voltage can be controlled by 0V to +5V analog input. Green LEDs indicate AC and DC power good. The TPCM3000 650 Watt 12 Volt AC-DC Front-End also has control and monitoring features and a +5V standby output. Operating temperature range is -20°C to +70°C. Safety UL60950-1 2nd Ed., CSA22.2 No. 60950-1 2nd Ed., EN60950-1 2nd Ed. 1. All units will also operate from 90-420VDC. Use model TPCPR1U3A shelf. 2. Input currents shown are nominal values at 120VAC/240VAC as appropriate. 3. To specify I²C Serial Communications append -Z to the model number. 4. For chassis-mount applications delete leading ‘T’ from model number, e.g. PCM7000. 5. To specify reverse airflow (exhaust at front) add suffix -R. Derate output power 20%. 6. These models have a front panel mounted IEC60320-C14 inlet. Derate output power 16.6% when reverse airflow (option -R) is fitted. Number 1, 2 Description Max.